The manor of Benham-Valence, which derives its additional appellation from the family of Valence, Earls of Pembroke, after passing through various ownerships, was granted by Queen Elizabeth I to "her faithful servant,'' John Baptist Castillion. His son, Sir Francis Castillion, sold the manor in 1630 to the trustees of Sir William Craven, from whom it passed through several stages of family descent to William, 6th Baron Craven, who had the present house built following the destruction of the previous structure in a disastrous fire. It was erected in 1775 under the direction of Henry Holland, in collaboration with his father-in-law, the great English landscape artist 'Capability' Brown. Lord Craven married, Elizabeth, youngest daughter of Augustus, 4th Earl of Berkeley, who married as her second husband the Margrave of Anspach. The manor of Benham-Valence was left by Lord Craven to his eldest son, who was created Viscount Uffington and Earl of Craven, 13th June, 1801, from whom it was purchased by the Margrave, who died at Benham in 1806, and bequeathed the estate to the Margravine. The house which was much enlarged in the late Victorian period, is an imposing building of the Ionic order, having an elegant portico in the south front, and stands at the head of a slight declivity. On the south is a fine sheet of water supplied by the Kennet, and on the North side the grounds are well sheltered by woods, around which the great high-road makes a sweep to the western gate. 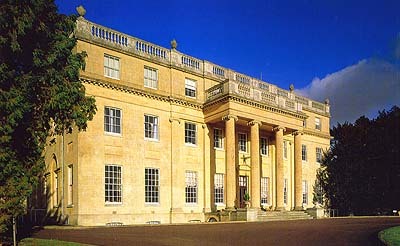 Benham Park was converted for use as offices in 1983 and was last offered for sale by Hillier Parker & FPD Savills in 1998.